Consumption of raw or undercooked oysters from British Columbia is blamed for 321 cases of norovirus gastroenteritis in three Canadian provinces, according to an updated report from the Public Health Agency of Canada (PHAC), released March 27. The outbreak, which has affected residents of British Columbia, Alberta and Ontario, began in December 2016 and is on-going. T he British Columbia Center for Disease Control (BCCDC) first alerted the public to the problem on Jan. 13, reporting more than 70 cases of norovirus gastroenteritis in four different health districts. All of the illnesses were associated with consumption of raw or undercooked oysters consumed either in restaurants or in private homes. On Jan. 20, Alberta Health Services (AHS) reported a cluster of 10 cases of gastrointestinal illness, which occurred in the Edmonton area between Jan. 10-12. The outbreak victims had consumed raw oysters. The cause of the illnesses was not verified by laboratory testing. On Feb. 2, Ontario’s Acting Chief Medical Officer of Health alerted residents of Canada’s largest province about 24 reported cases of “gastrointestinal illness consistent with norovirus” in individuals who had eaten raw or undercooked oysters. PHAC issued an initial Public Health Notice on Feb. 7, and has been updating the case count periodically. As of March 28’s update, 321 clinical cases of gastroenteritis linked to oysters had been reported between Dec. 4, 2016, and March 18, this year: 223 in British Columbia, 42 in Alberta and 56 in Ontario. Not all of the outbreak victims were tested for norovirus; however, testing in several cases has confirmed the presence of the virus in those patients. According to a spokesperson from the Canadian Food Inspection Agency (CFIA), seven shellfish aquaculture sites have been temporarily closed by the Department of Fisheries and Oceans. The closures are based on sample results and/or epidemiological assessments. Investigation is on-going into other harvest areas that have been linked to illnesses. CFIA has mandated additional control measures for shellfish processing establishments to follow, and is conducting compliance verification activities to confirm that the supplementary measures have been implemented effectively. According to a March 7 notice to the industry, these additional measures will remain in effect until the outbreak has been declared over. Seattle-King County Public Health is investigating a series of illnesses associated with consumption of oysters harvested along the Washington coast. Between Jan. 10 and March 20, as many as 39 people may have become ill after eating raw oysters at one of several different restaurants or private events in the county. King is the most populous county in Washington State. Seattle is the county seat, and is the location of most of the restaurants associated with the illnesses. Victims of the outbreaks suffered from nausea, vomiting and diarrhea. No laboratory confirmation is available; however these symptoms are ‘suggestive’ of norovirus, according to a March 28 news release issued by THe health department. While oysters served at the retail locations were harvested from various areas along the Washington coast, one small part of Samish Bay accounted for 22 illnesses linked to four servings. A section of the Samish Bay growing area was closed on March 17 for all species. 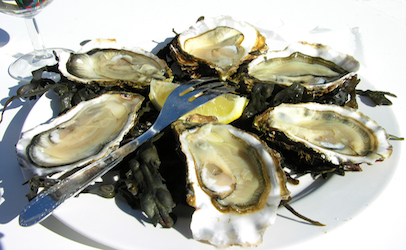 In recent months, outbreaks of norovirus gastroenteritis in countries as far apart as New Zealand and France also have been linked to consumption of raw or undercooked oysters. An unspecified number of reported illnesses in France triggered a Jan. 5 suspension of oyster and mussel harvest from Thau in the Hérault prefecture. Live bivalve mollusks from Thau were exported to China, Germany, Hong Kong, Italy, Luxembourg, Macao, the Netherlands, Thailand, Ukraine and the United Arab Emirates. Bivalve mollusks (clams, oysters, mussels and scallops) feed on algae. Oysters take in 1.5 to 10.0 liters of water per hour per gram of body weight, which can amount to more than 50 gallons of water in a 24-hour period. Plankton and other suspended matter, including bacteria and viruses, are trapped as the water passes over the gills and concentrated within. In a study published in December 2016, French researchers used nucleic acid amplification techniques to estimate the number of norovirus particles in oysters implicated in several outbreaks. They found between 43 and 1170 viruses per oyster. Norovirus has a reported infectious dose of just 10-100 particles. Thus, consuming even a single contaminated raw oyster could be enough to infect a susceptible consumer in some cases. Norovirus gastroenteritis is a short-lived but highly unpleasant illness. Typically, symptoms include nausea, vomiting and a copious, watery diarrhea, and last from one to five days. The virus is highly contagious, and can be spread through contaminated food and water, via direct person-to-person transfer, or through hand-to-mouth contact with contaminated surfaces. With an incubation period of just 24-48 hours, the illness can snowball in confined places, such as cruise ships, hotels, hospitals and nursing homes. Ensure oysters are fully cooked before consuming them. It is recommended to cook oysters to an internal temperature of 90° C (194° F) for a minimum of 90 seconds. Quick steaming or cooking oysters until the shells just open is not enough to kill norovirus. Eat oysters right away after cooking, and refrigerate leftovers. If you develop symptoms of nausea, vomiting or diarrhea, wait at least 48 hours after the last episode of vomiting and/or diarrhea before preparing any food for others.